I have been a practitioner of tenkara fishing for over five years now. Like many of you, I have caught a lot of flack from friends, family, and others on social media about my enjoyment of the method, but I’m an attorney, so I am pretty thick-skinned. The truth is, in many situations, tenkara is as effective (or more so) than a western rod. For small creeks and rivers, I use nothing but tenkara, but still use a rod and reel for big rivers and streamer fishing. Last year, for me, one area where the verdict was still out on the effectiveness of tenkara was alpine lake fishing. I had done it before, but was not convinced it was an effective method. Last July, I had the good fortune to hike with my daughter and a few others from church up to a high mountain lake on the Wyoming border. While the hike was not super strenuous, it was long. However, my pack was not too heavy with my lunch, water, and fishing gear. The hike to the lower lake was about four miles and it is–at least–an extra five miles to reach the upper lake, but the hike was so worth it! Upon reaching the lake, it was way bigger than I expected and its turquoise hue was absolutely stunning, but with the tight trees all around its banks, how would the fishing be? The view alone was well worth the hike. Once at the lake, all the kids and youth leaders rested and ate their lunch, but I grabbed the Badger UNC tenkara rod, telescoped it out to length, and scanned the water for any cruising fish. Sure enough, there was a nice cutthroat less than ten feet out. I quickly cast the Renegade in its course and, without any caution at all, the fish rose up and sucked it in. I hooked the fish, but it quickly got off before I could land it. The lake was loaded with beautiful Yellowstone Cutthroat. Within a half hour’s time, I hooked and landed plenty of other good sized cutthroat, enough to bring one of my tenkara nay-saying friends, Scott Johnson, over to try his hand at a few. I can honestly say that for this lake, tenkara was no handicap whatsoever for either of us. “Okay, come climb up on this rock and look for cruising fish to cast to.” I replied. As if she had been fly fishing her whole life, Eden began spotting fish and casting toward them. We both watched eagerly as a fish rose to fly. Eden struck, but was a bit slow the first try. “Man, that was close!” I lamented. “Try it again!” Fortunately, there is no shortage of targets in the lake and Eden quickly placed the fly in the path of another. On the second strike, she drove the point home and was able to quickly land the trout. “Alright, Eden!” I praised in excitement. Eden is a natural with the tenkara rod. The leaders of the hike soon called for everyone to pack up and get back on the trail, but before time ran out, Eden landed three or four trout. We hated to leave such a beautiful place. Eden bringing in a beautiful trout. After this experience, I would without hesitation add tenkara as an effective method for high-mountain lake fishing. I think my daughter Eden would agree. Eden with a nice cutthroat. My parents had eight kids and now all of my siblings are married with kids of their own. So, to sum it up, the Wayment family is simply huge (pronounced like the POTUS). We all love each other, get along, and treasure the rare times when we can be together. Last July, we rented a cabin in Garden City, Utah for a much-needed family reunion. I believe the last time all of us were together was when our beloved dad passed away in 2014. When the Wayment Family gets together, you can pretty much bet on three things: (1) Some of us are going hunting or fishing; (2) Mexican Food will be eaten (or some other good food like Cajun or BBQ); and (3) gourmet root beers will be consumed (we’re Mormons so we don’t drink alcohol). Last year’s reunion was no exception to this rule. 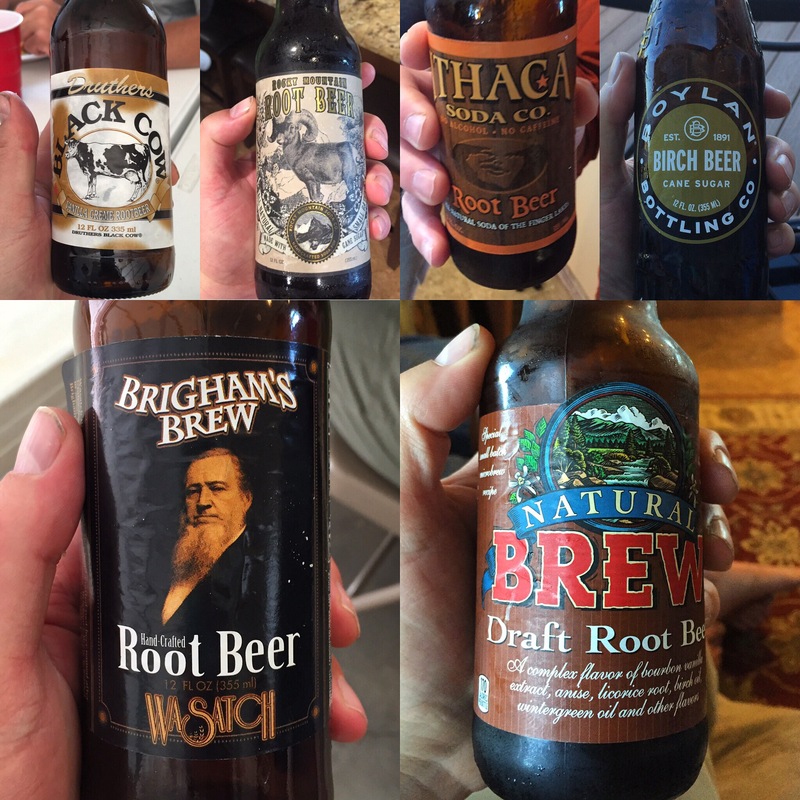 Speaking of Mormons, this root beer named after Brigham Young was one of my favorites from the trip. Most of the family arrived at the cabin on Thursday, July 7th and we just sat around and enjoyed each other’s company. Brother Shawn had brought a whole cooler of gourmet root beers and, of course, we sampled a few. The following day we had to spend the obligatory time on the sandy beaches of the Idaho side of Bear Lake, the “Caribbean of the Rockies.” Honestly, I can take or leave that, but my kids enjoy it. I talked my wife into sneaking away to go get one of those famous raspberry milkshakes Bear Lake is known for, so the day wasn’t a total loss. After dinner, things improved tremendously as my daughter, Nessy, and brother Scott agreed to go fishing with me on St. Charles Creek in Idaho. My nephews, Jared, Easton, and Steele also tagged along for the adventure. Nessy and I shared a Tenkara USA Rhodo rod and Scott and Jared used their western fly rods and reels. The creek was overgrown in most places making it difficult to cast and to wade, but we caught a few small trout. In a seam where two currents conjoined below an island, a beautiful brook trout rolled on my Renegade and I quickly brought him to hand. Nessy got a little frustrated with the thickness of the foliage and the technicality of the creek, but gave it a good effort. Our problem was that we had a hard time finding water open enough for her to cast. As darkness descended upon us, we came upon a high beaver dam. In the failing light, we could see the wink of rising trout in the calm water above the dam. My tenkara rod did not have the length to reach these fish, so I borrowed my nephew, Jared’s rod and reel. I caught a few fish on Renegades, including a nice Bonneville Cutthroat. Though the fishing was a little tough, everyone had fun. We capped off the night with a raspberry milkshake in Garden City. That made two in one day for me. Can life get any better? I submit that it cannot! Saturday, the bulk of the Wayment clan hiked up to a popular high mountain lake. I’d tell you the name, but the lake is already so overcrowded as it is. Have you ever seen that video meme on Facebook in which a dude swings on a rope swing out into this pristine lake and gets munched by a monstrous fish? I believe that video was taken at this particular lake. Too bad there aren’t any monster fish in the lake like the one in the meme. Once at the lake, I used my 2-weight St. Croix Ultra Legend rod and reel , Tommy, the Rhodo, and Nessy, the Badger Tenkara Medium Flex Classic. I caught a bunch of fish on Pistol Petes. Both Tom and Ness caught fish on nymphs. The water was so clear that we sight-casted to cruising fish both in the lake proper and its outlet. After catching one particular rainbow, Nessy shed a few tears as she worried that it would not make it. With a smile on my face, I said to her, “There’s no crying in fishing!” as I helped her unhook and release the fish back into the lake. And, if you are wondering, it swam off and we did not see it go belly up. So that was a relief. I really enjoy fishing high mountain lakes. This may be sacrilege for a tenkara blog, but tenkara is not the best tactic for lake fishing because you can’t cast as far or strip the flies in like you can in western streamer fishing. However, it is a great method for kids because the rods are easy to cast and kids learn quickly that you simply have to move the rod tip to move the fly. I was glad to see my kids catch a few on tenkara by themselves. Nothing gets me more excited than to see my kids learning to love fishing. To sum up, the Wayment Bear Lake Family Reunion was a good time. It was fun to be together with my favorite people on earth in such a beautiful place. I drank a total of four raspberry milkshakes (the family record, I think) and who knows how many root beers? Shawn and I got to shoot our bows a few evenings. And, to top it off, we caught a few trout. I’d call that a successful trip if ever there was one. 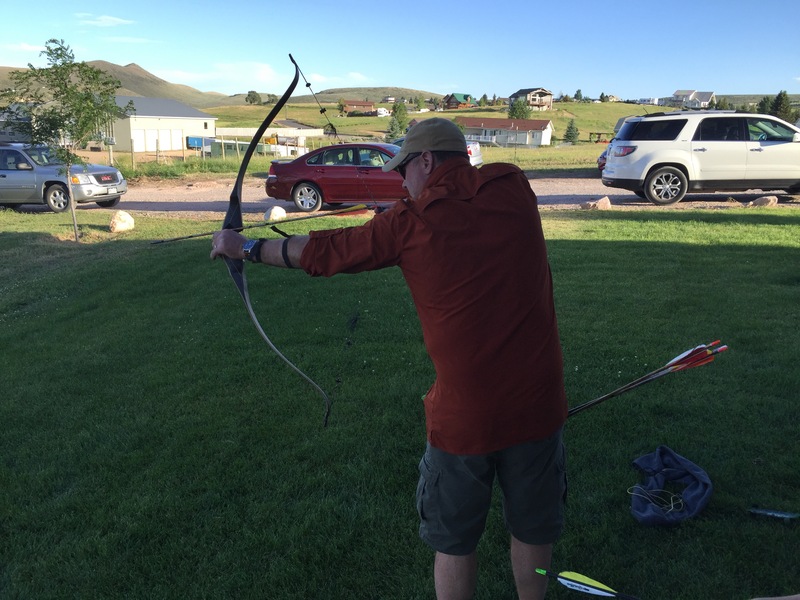 Shawn shoots the long bow…I mean a recurve. That’s some dang good root beer right there! Most of the Wayment grandkids, but not all. That’s a pretty big pile of kids!